Manttra is an offshoot from the TTK group of companies which are quite reputed in India for quality products. Manttra has retained the quality of the parent group while expanding the range of pressure cooker products on offer. Manttra pressure cookers are available in wide range of series with each one offering some basic or advanced features to fit the budgets and requirements of various customers. These are standard aluminum cookers available in four, five, six and eight quart capacities. These cookers come with a unique gasket release system where excess pressure is automatically released and lowered to maintain safe cooking conditions. Even the base of these cookers is quite thick to ensure better durability, efficient cooking and even distribution of the heat while cooking. These cookers come with an external fitting lid which increases the total capacity of the cooker too. The handles are streamlined for easy operation and have flame guard protection. As you would have guessed, these pressure cookers are sleeker versions of the 100 series. While they have very similar features, the designs of these models are more appealing and it comes with a shinier finish to the final product. In the olden days pressure cookers were more about cooking large quantities of food in a healthy manner. In the modern lifestyle, it is not just about healthier cooking but also about quick cooking. Working adults, university students and others are people who are looking for something quick and easy – that is precisely what this series of cookers has to offer. These models come in three versions: aluminum, stainless steel and anodised aluminum. They have a unidirectional pressure regulator to ensure steam is always released away from you. It also has a quick steam release button which you can set to cooking mode, quick release mode or open position. 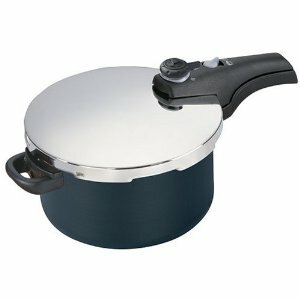 This is a typical product designed as a pan. This serves dual purpose of cooking the food and then as a pan for furthering processing it. So you can first pressure cook the food and then use the same vessel as a pan and season it with spices and cook it further. You get the usual pressure cooker lid and a transparent lid for both styles of cooking. This comes with the one touch pressure control knob and auto lock system. These are sleek pressure cookers that combine the safety and easy features of the Chef’s pan and "Quick and Easy" series into the standard pressure cookers making smart pressure cookers. You can set the pressure to low pressure 8 psi or high pressure 12 psi modes. These come in four models: standard aluminum, stainless steel and the anodised versions which are available in two colours. The advanced and newer version of these cookers is the Smart Plus cookers. Auto lock system to automatically lock the cooker while you close the lid. capacity of 7.3 liters or 8 quarts. These are a set of cookers that can be used for multiple purposes – hence the name. You can get them in stainless steel and aluminum ranges. These cookers can be used as regular pressure cookers or as pasta makers or as stock pots for stews and soups or for simmering vegetables. The coloured aluminum or mirror polished stainless steel add a classy look to your kitchen and make it simpler to handle the cooker. Besides, with multiple uses on a single vessel, you save not only space but also a lot of time too. These modern and intelligent pressure cookers from Manttra can be used for multiple purposes just like the multi cookers. The benefit of this range of products is that they are all powered by electricity, so the cooking can be programmed and controlled better than traditional cookers. With the control panel you can program the pressure cooker as you desire. These cookers come in two forms the stainless steel ones and the non-stick ones. Even these cookers have the one touch pressure control, auto lock and pressure indicator features like some of the latest models from Manttra.